SITTARD, THE NETHERLANDS, November 12, 2018 - SABIC, a global leader in the chemical industry, announces the launch of a new impact copolymer (ICP) grade – SABIC® PP PPA20 – targeted at demanding home appliances as well as high-end cosmetics, furniture and other household consumer goods. Apart from its high gloss feature that enables production of aesthetically appealing surfaces, the new compound is developed to offer well-balanced mechanical properties and easy processability, making it a promising alternative to incumbent ABS materials in these markets. By 2050, the global population will grow to over 9 billion, with metropolitan areas expanding over-proportionally. Smart cities will be the home of an increasing middle class with a global spending power expected to reach $20 trillion already by 2020, and a wealth of connective electrical and electronic appliances will form a new generation of smart consumer devices. We are firmly committed to meeting the needs of the home appliances industry for healthier and more sustainable as well as cost-efficient material solutions enabling manufacturers to benefit from this enormous market potential. New SABIC® PP PPA20 polymer is aimed to provide a combination of high gloss, high scratch resistance and low stress whitening over regular impact copolymers together with balanced impact strength and stiffness. In comparison with other, potentially more costly and overdesigned solutions – high-gloss SABIC® PP PPA20 is engineered to deliver comparable optical properties and scratch resistance along with superior processability. In many application cases, it can offer brand owners, molders and OEMs a significant cost and energy savings potential based on its lower density, higher flow and faster crystallization than currently used materials resulting in potentially shorter cycle times. Further energy savings may be leveraged as the material eliminates the need for pre-drying and can be injection molded at lower mold and barrel temperatures versus ABS. Low density and high flow also open conceivable new material and weight saving design opportunities for more resource-efficient and waste-reducing products, such as from sleek housings with lower wall-thicknesses. However, the more important advantage for consumers may be the phthalate-free polymer technology of SABIC PP® PPA20, which answers the need for improved consumer health safety in – for instance - food contact appliances. SABIC® PP PPA20 addresses the needs of designers and molders in these markets for aesthetic as well as cost-efficient and more sustainable materials with higher performance characteristics for functional innovation and enhanced consumer experience. This advanced high-gloss impact copolymer polypropylene is outstanding proof of our dedicated market and customer focus as we reach into new application possibilities for profitable partnerships and mutual growth. Already available in the Europe, Middle East and Africa regions, SABIC® PP PPA20 is to be phased in commercially in the Americas in 2019. 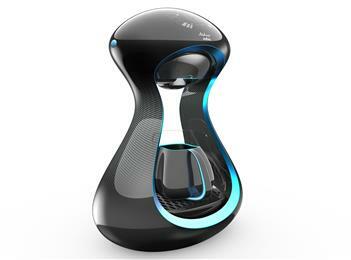 Sleek aesthetic coffee maker housing designed for cost-efficient injection molding with high-gloss and impact resistant, food-compliant SABIC® PP PPA20 impact copolymer.